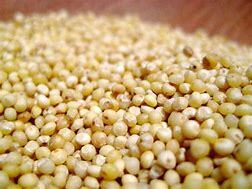 How To Make Your Own: Take whole millet grain, place in high output blender, food processor, or coffee grinder and grind until fine. Preheat the oven to 350º F. Lightly grease a 9-inch Pyrex pie dish. Line a baking sheet with parchment paper. In a mixing bowl, whisk together the flours and dry ingredients. Add in the shortening by pieces and cut in the shortening (with a fork or a pastry cutter) and mix until the mixture looks sandy. Add in the pumpkin, egg (or egg replacer), maple syrup and rice milk. Beat the batter briefly until the dough forms a smooth mass. You do not need to beat the dough very long- just until it is mixed. Scrape the dough into the prepared pie plate. Using lightly oiled hands pat and shape the dough into a smooth flat round. Press the dough all the way to the edges of the pie plate. Use a thin sharp knife to slice the dough into six wedges. You can bake the scones together in the pie dish, or separate them and bake them on a baking sheet. To bake them on a baking sheet: Use a thin and flexible spatula to remove the wedges from the pie dish one at a time and place them on the parchment lined baking sheet. Using a knife or thin spatula, reshape and define the scones, if you need to. If you like a crunchy top, sprinkle the scones with raw sugar crystals. Place the pie dish - or the baking sheet- in the oven. Bake until the scones are firm and slightly golden- roughly 20 minutes. Cool the scones on a wire rack and make the maple nutmeg icing. Use only a little liquid at a time as you beat the frosting. If it gets too thin, add more confectioners’ (powdered) sugar. Beat until smooth and add more rice milk a tablespoon at a time until the icing is creamy- but not too thin. Taste test and add more nutmeg if it needs it. Beat the icing for three to four minutes (this improves the texture). Spoon the icing into a pastry bag fitted with a simple tip (or use a plastic sandwich bag with a tiny hole cut in one bottom corner). Chill the icing while the scones are cooling a bit. Squiggle the icing on top of the scones, or spread on the frosting with an icing knife, if you like a lot of sweetness adorning your scone. Serve immediately. I'm serious. Don't wait. Eat up, Darling. These scones are best enjoyed fresh from the oven.